Last year we talked about a PancakeBot pancake printer that is sort of like a 3D printer for breakfast food. At the time the device first surfaced, you couldn’t buy one. You could get directions to build your own from Lego if you were so inclined. If you don’t want to build your own, we have some good news for you today. The PancakeBot printer is now on Kickstarter seeking funding. The project was looking to raise $50,000 and ended up rising over $68,000 at the time of writing with 31 days to go. That means it will raise a lot more money. You have already missed out on the best early bird deals, but you can still order up your own PancakeBot for $179. The PancakeBot will ship in July. 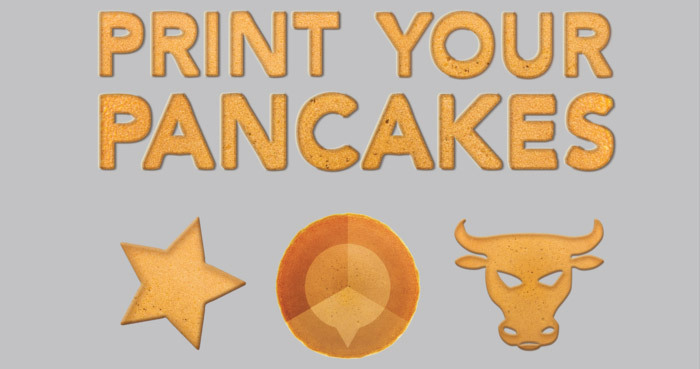 For the money, you get everything you need to print out custom pancakes, including software. That software allows you to trace any image using your computer and send it to the pancake machine to make breakfast in just about any shape you can think of. The software is available for Mac and Pc users. This will make breakfast an event.